The legal requirements and planning permission is extremely important when using music and locations that are owned by others as well as the parental permission of any actor who is under the age of 18 to allow me as the director and producer to use their image online as part of the coursework. This is vital as sometimes parents would rather not have their child filmed or photographed. Whilst looking for more information on the matter I found a useful link with states everything that should be completed before creating a whole film. As I am not producing a whole film some of it is not relevant such as finance. I have created a brief letter of permission explaining what they will be doing and what for, which is to be sent out to the parents or carers of the actors as they are all under 18. Here is what the letter looks like and says before it is given out. I feel that obtaining all the required rights to the music i will use will be very complicated. There are a number of ways to get the permission of the piece of music which is too one contact the musician directly or the record label. The location I am planning to use to film my trailer is a nearby field and forest. I will not need to have permission as it is a public place and a lot of different people are seen walking there dogs through the area anyway. 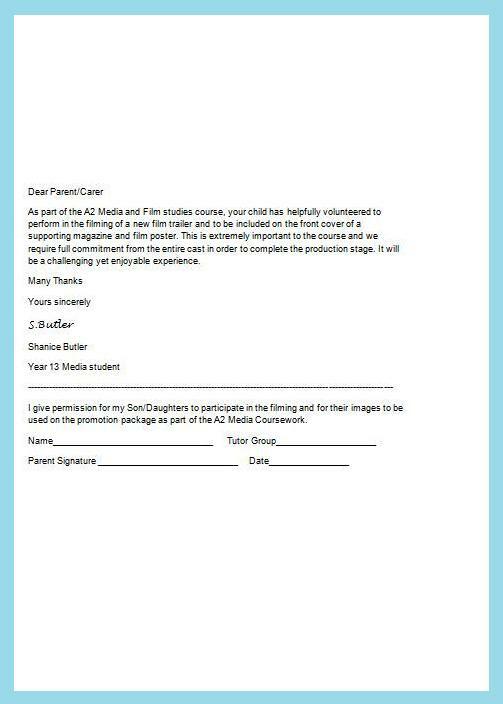 However if by accident a young child or other people get into the shots, I will have to be prepared with more permission forms to give to them and sign so they are comfortable with their image being used. Hopefully this wont happen as all professional film trailers don’t have any other people apart from the assigned actors. If the place I have chosen to shoot is a problem I will then have to contact the local council by email or by calling to ask if it will be alright and then hopefully come to an agreement. After i have done this i might even be allowed to section of a part that I would like to use.